Discover more free podcasts and short listens only available from Audible here. Hello Sleep's guided meditations are based on the techniques and practices of mindfulness meditation which have been scientifically investigated and found to help insomnia. Created by meditation entrepreneur and author, Rohan Gunatillake, Hello Sleep's straightforward meditations will help quiet the busiest of minds and encourage the transition to sleep. Comprising two introductory episodes and twelve standalone guided meditations, Hello Sleep allows you to find what works best for you, helping you regain restful sleep. 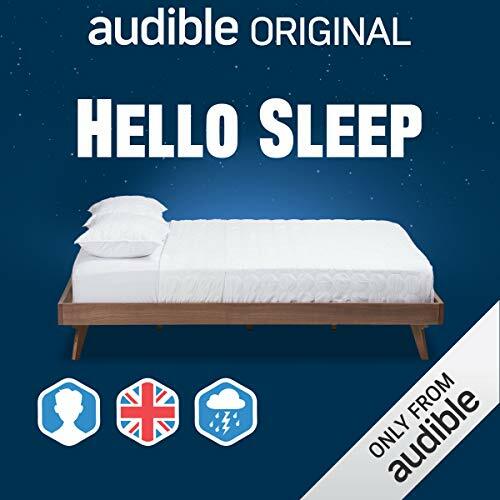 This version of Hello Sleep features a UK Male voice with Thunderstorms in the background. However, if you would like to change your choices, Hello Sleep allows you to choose different voices (UK Female, UK Male, US Female, UK Male) and different background (Cicadas, Silence, Thunderstorms, Waves, White Noise) to customise the meditations to your exact preferences. This series was produced by Rohan Gunatillake and is narrated by Rex Anderson, Sam Deveraux, Stacey Glemboski, and Lucy Gunatillake. As an Audio Show - free for members - when you add Hello Sleep to your library, you'll get 14 episodes, including 12 meditations. Please note, episodes 1 & 2 on every version are introductions and are narrated by Rohan Gunatillake. Please note, episodes 12, 13 & 14 deliberately contain no background sound effects. If you'd like a different voice/background sound combination, choose your preference by visiting the Hello Sleep landing page here. AUDIBLE please fix this!! I start with the body sweep and and am almost asleep but due to no continuous play of the content I technically have to 'wake up' to play the next part. Not very sleep inducing at all! Your audible shows should play continuously, or at least have a 'queue' or play next function like podcasts do. Avoid the first couple of chapters if you want to fall asleep. Appreciate the science behind the broadcasts, but these are really not relaxing! From a UK Reviewer.... others may love it.